Bad Dad's popular 992 Front Floorboards are now available! 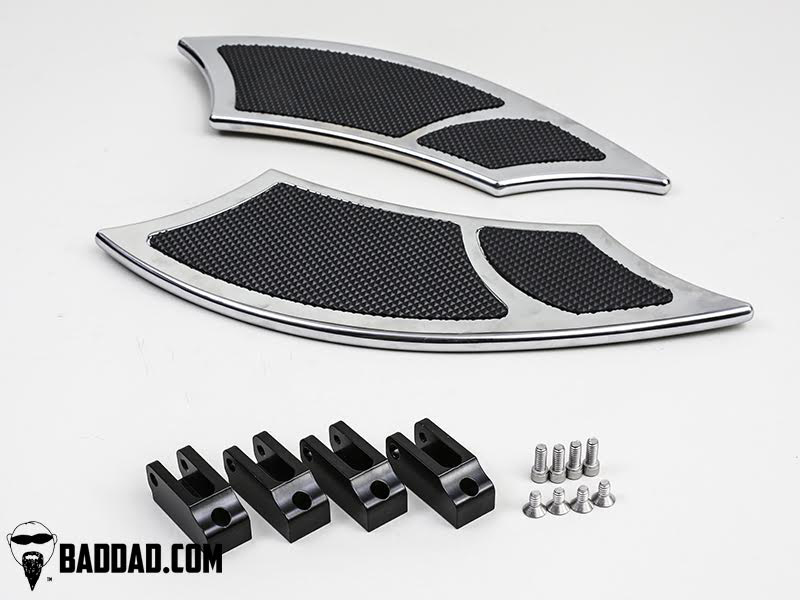 These custom floorboards are CNC machined from 6061 aircraft grade billet aluminum and are available in black powdercoat and chrome. Bad Dad's floorboards are finished with a high-quality custom cut rubber insert for a great look and comfortable ride. The custom 992 Floorboards are available for any Touring models and include all of the appropriate mounting hardware for your bike. These awesome floorboards are a direct bolt-on for your Street Glide, Road Glide, Electra Glide, or Road King. Bad Dad's 992 Passenger Boards and 900 Series Brake Pedal & Shift Pegs are available to complete the set. Measurements: Length: 16-9/16". Width at widest point: 5-1/4". Thickness: 1/2" billet.